Classic-Castle.com • View topic - When is a cow not a cow? Legozilla - These are motorized! 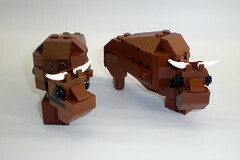 Use this thread to discuss all other bovinae ungulate MOCs, be they water buffalo, musk ox or yak. Re: When is a cow not a cow? Bruce N H wrote: When is a cow not a cow? Rick-Ricks wrote: When it's a squirrel. Kind of a "meh" mosiac for me, but it's still pretty cool and recognizable.